Atlanta is gearing up to host the 53rd Super Bowl this weekend, so we've put together a guide to the Southern US city's most interesting buildings in case American football isn't your thing. Known to locals as The High, this minimalist museum found its home in Meier's 135,000-square-foot (12,500-square-metre), white-concrete edifice the year before the New York architect won the 1984 Pritzker Prize. It was later expanded by fellow Pritzker laureate Piano to add more exhibition space. The museum now houses an impressive collection, and hosts a rotating series exhibitions and installations by international designers, who have recently included Daniel Arsham, Jaime Hayón and Yuri Suzuki. A soaring atrium – which allegedly provided a model for Star Wars' Death Star – sits at the heart of this 22-storey hotel, one of the first of its kind completed by late American architect John Portman. 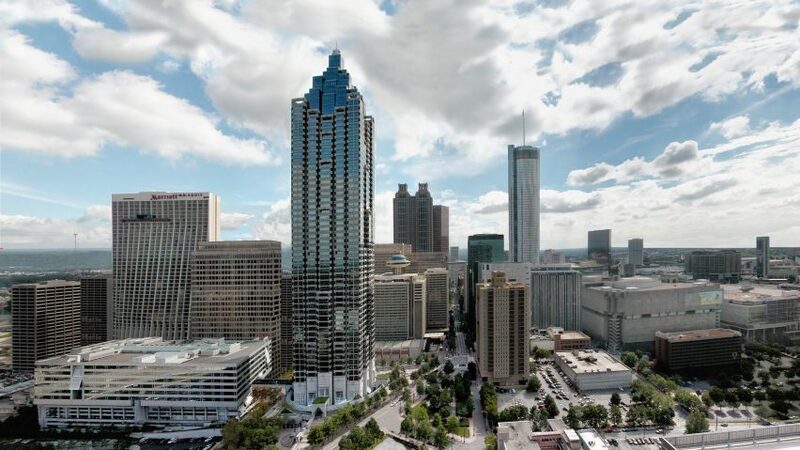 Created as part of his major downtown redevelopment called the Peachtree Center, the Hyatt Regency's central space is surrounded by balconies and features futuristic elevators, all illuminated by a translucent skylight. Breuer's monolithic Central Library bears similarities to his famous Manhattan museum, with large expanses of flat external surfaces, punctured sparingly by small inset openings. The Hungarian Bauhaus member and teacher died shortly before the building was inaugurated. His structure came under threat from demolition in 2016, but was saved by preservations and will now undergo renovation works instead. Architects Philip Johnson and John Burgee completed this 50-storey office building in 1990, comprising conjoined towers wrapped in granite and grey-tinted windows. Each is topped with a decorative crown that is illuminated at night, creating a pair of beacons to signal the city's current fourth-tallest skyscraper. This brutalist chapel at Emory University is most recognisable for its tiled barrel roofs, arranged in rows at different heights, and the tall concrete panel that bears a crucifix. Inside, the curved ceilings are exaggerated by exposed beams, and wooden surfaces add warmth to the otherwise austere material palette. Photograph by Mary Ann Sullivan. Elsewhere on the Emory campus, postmodernist Graves created a 40,000-square-foot expansion to a Henry Hornbostel-designed law school that his studio previously renovated into museum galleries and classrooms. The new wing was completed in 1993, visually reinterpreting elements of the original building in a more simplistic and streamlined way. Japanese sculptor Isamu Noguchi formed this children's playground – one of several he designed throughout his career – with equipment made from simple geometric shapes and coloured with primary hues. Triangular red climbing frames, oversized 3D Tetris blocks and a blue slide spiralled around a cylindrical tower are among his objects clustered together within Atlanta's Piedmont Park. Another section of Portman's huge Peachtree development, the seven-million-square-foot (650,000-square-metre) AmericasMart is one of the world's largest permanent wholesale trade centres. Comprising three buildings connected by pedestrian bridges, the complex hosts several major trade shows each year, and retailers can rent permanent showroom spaces that open year-round. Photograph courtesy of International Market Centers. This 42,000-square-foot (3,900-square-metre) facility was constructed on land donated by the Coca-Cola Company – at the heart of the city's tourist district – and acts as an educational and community hub for the past, present and future of the Human Rights Movement. The building's multi-toned metallic panels are intended to represent different skin colours, while its angled curving walls mimic protective hands. For sports fans or not, HOK's 71,000-seat venue that plays home to the Atlanta Falcons NFL team is a spectacle – built from huge faceted plates that overlap to surround the central bowl. The stadium's most notable feature is its retractable roof, formed from eight ETFE "petals" that slide past each other like a camera aperture to open or close.